Guest writer David Samuel, who’s close to the action in the UK, gives us his take on the big day. While most people in the UK are simply thankful for an extra bank holiday and extra beer drinking time, the rest of the world have embraced the royal fever and the Royal Family have certainly embraced social media. No monarchy is as popular, and as well liked, as the Windsors right now. With a TV & Online audience set to topple the 2 billion mark, the question on everybody’s lips is – where will you be watching it? 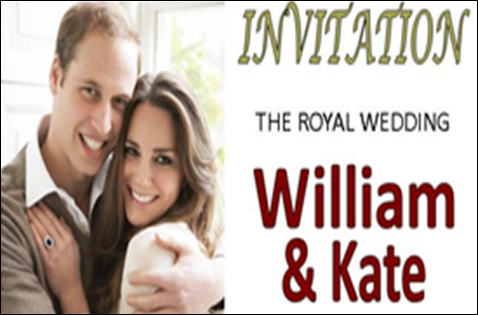 Wise to the royal frenzy, Google have recently announced that the royal wedding of Prince William and Catherine Middleton, on April 29, will be streamed live on YouTube. The live stream is set to start at 0900 GMT with millions expected to login and watch it live. The music performed at the wedding ceremony will immediately be made available for download. Viewers will also be able to follow all the action on Twitter, as well as download Royal apps leading up to the big event. Unless you switch your TV off on the day of the royal wedding, you’ll have a very hard time escaping it. To say the royal wedding will be a huge media event is a colossal understatement. Every news organization worldwide, will be contending for position to broadcast the royal wedding live. Many electrical retailers have reported increased sales in TVs and projectors – with many splashing out on a new HD TV to watch the couple looking their royal best. The Brits certainly know how to party, and with the Prime Minister urging the nation to “get on and have fun” on the day of the royal wedding, most will gladly oblige. Over 4,000 applications for street parties have been requested in England and Wales on the day of the royal wedding. With 2 million expected to celebrate on the streets, so no excuses grab your Union Jack attire and join the fun. The famous Regent Street in London is now cloaked in Union Jack flags in preparation for the royal wedding. An extra 600,000 tourists, from home and overseas, are expected to congregate along the procession to get a glimpse of the royal couple. While many broadcasters were salivating at the thought of the first 3D royal wedding, it was soon ruled out by Buckingham Palace. Google once again, not missing a trick, expanded its Google Earth 3D imagery to include the entire route of wedding procession. Google declared that “With this new 3D data covering the royal procession route, you can indulge yourself in a “royals’-eye”. The social media coverage of the royal wedding is unprecedented and, is “in line with the couple’s wishes to make the wedding as accessible as possible for as many people as want to participate,” stated Buckingham Palace. The role of social media in the royal wedding highlights just how far media communication has developed. The wedding between Prince Charles and Dianna, 30 years ago, was only available on TV, with viewers now likely to be watching the event on television, or YouTube, while liaising with theirs on social media accounts such as Facebook and Twitter. It really is a digital revolution and all that is left to do is wish the happy couple a happy future. David Samuel is an electronic media consultant, with over 13 years’ involvement with some of the leading electronic retailers. David’s awareness and market intelligence make him one of the best equipped experts around. While specialising in LCD TVs David’s knowledge covers a wider spectrum of consumer electronics. It really is a frenzy the UK right now…I’ll be taking my TV outside if the sun is shining. I know billions are set to watch this event around the world, but I for one will not be. I’m so over it already, I’ll catch the highlights on the evening news that will do for me.